Home » Blog » Is Theresa May going to bring about a Constitutional Crisis? Following the Chequers meeting, BBC News (2016c) cited former Foreign Office minister Hugo Swire as saying there was a “definite fault line” between ministers who believed Brexit was chiefly about ending free movement and those who wanted to see more “flexibility”, meaning the UK did not yet have its “ducks in a row” for negotiations. Small wonder that Scottish first minister Nicola Sturgeon has accused the UK Government of “breathtaking complacency” and “making it up as they go along” (BBC News). There are even whispers that the Scottisn National Party are so frustrated by May on Brexit that they may, after all, go for a second independence referendum. After the 23 June vote, the received wisdom was that, in spite of the huge divergence between Scots and English voting, the SNC were so concerned about the predictions for the economy of an independent Scotland that they would try to stick with the UK concept for the time being while trying to ensure the final Brexit deal gives Scotland the best possible access to the European Single Market. The Evening Standard’s Hannah Al-Othman is just one reporter saying that Sturgeon has even floated the idea of a reverse Denmark/Greenland arrangement. Denmark is an EU member but it’s Greenland ‘region’ is not. Sturgeon speculated whether the UK could not be a member but its Scotland ‘region’ could be. Now, the SNP are reported by such as BBC News’ Phillip Sim to be proposing a ‘listening’ exercise to gauge the likelihood of success if a second independence referendum were to be called. 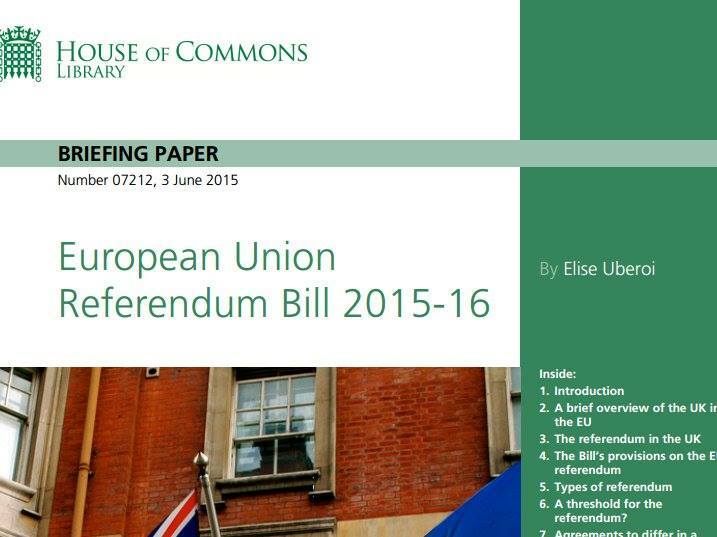 Ahead of Chequers, ‘sources’ for No 10 were widely reported – eg: The Observer’s Nicola Slawson – to be briefing journalists that No 10 has been advised by its lawyers that it can trigger Article 50 to implement Brexit without needing to reference Parliament. Pickard adds that a Downing Street spokesman made clear that MPs would not be given a vote on Brexit and that May would respect the will of the public to leave the EU as expressed in the referendum – all confirmed by May on Sunday, according to Sky News. The spokesman added that there was no legal obligation to consult Parliament before initiating the Article 50 process. The media memes generated from these briefings included such ‘undemocratic’ notions as MPs being given the opportunity to express their views in a debate without a vote or even just being allowed to write to the prime minister to put forward their views. The crux of the argument that May can trigger Article 50 without a vote in Parliament is based on the concept of the royal prerogative. Essentially the monarch can do anything she wishes because she has ‘absolute power’. This absolute power, in terms of executive power, can be delegated to the monarch’s representative. Thus, Queen Elizabeth II delegates her power to her prime minister, Theresa May. However, the monarch’s legislative power is exercised by Parliament. It took the European Communities Act (1972) for the UK to join tbe then-Common Market. EU legislation all has to ratified by Parliament . Therefore, it would seem it will need an act of Parliament for the UK to leave the EU and re-establish the autonomous sovereignty of the UK Parliament. Thus, theoretically, May could trigger Article 50 using royal prerogative but Parliament would have to at least repeal the European Communities Act otherwise it remains on the statute book. As the vast majority of current MPs – up to 480 – and most peers in the House of Lords have supported remaining in the EU, there can be no guarantee May could achieve that. Thus, 2 years after using the royal prerogative to trigger Article 50, potentially the UK could be in the ludicrous situation of having completed its 2-year exit timeframe and thus be out of the EU as far as EU law is concerned but still in the EU as far as UK law is concerned. Slawson cites Labour leader contender Owen Smith as offering a means of avoiding this: if he was to become the opposition leader, he would “press for whatever final deal she, Boris Johnson, Liam Fox and David Davis come up with” to be put to the British people, either in a second referendum or at a general election. Of course, May currently is against either option. There simply is no justification for use of the royal prerogative in the way it seems May intends to use it. In its last review of what the royal prerogative is, the Public Administration Committee (2008) concluded that some prerogative powers can be directly exercised by ministers without the approval of Parliament, including emergency powers such as declaring war and of making peace. Lesser powers such as the issue of passports and the granting of honours may also be assumed by ministers. Brexit is deadly serious but it is far from an emergency. 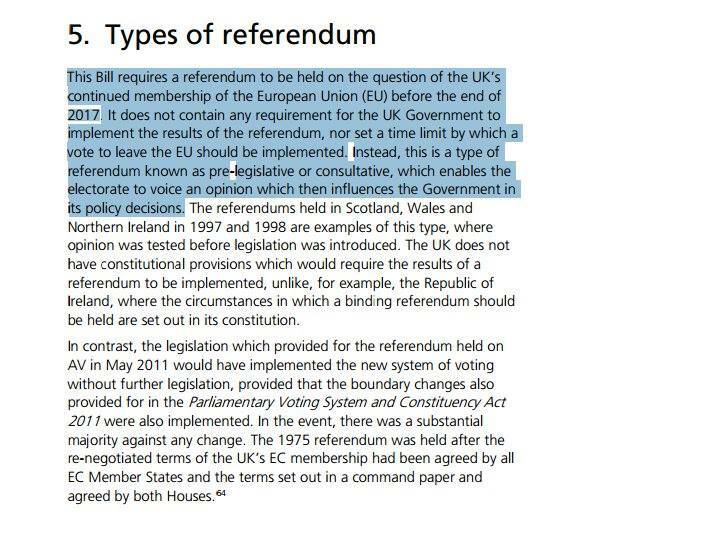 The 23 June referendum was a ‘consultative’ exercise – as made clear in the photocopied excerpts below of the Referendum Bill Briefing Paper from the House of Commons library. The results of the referendum simply are not binding and neither the Government nor Parliament is obliged to do anything about it. So there is no legal case for the executive trying to circumvent opposition in the legislature. Bizarrely most of May’s cabinet voted to Remain, including herself. The margin in favour of Leave was just 3.78% of the electorate who voted which is not statistically significant. So there is no real moral or ethical case for forcing through Brexit against the wishes of Parliament. Small wonder that a legal challenge is being mounted in the High Court to stop May triggering Article 50. Mishcon de Reya, a leading law firm, is bringing the action on behalf of a consortium of clients and the hearing is due to held in October. Of course, theoretically, the Queen could block May triggering Article 50. Her executive power is only delegated to the prime minister and, in theory, could be withdrawn. Say Parliament were to petition the Queen to block May triggering Article 50, that would put Her Majesty in a very difficult position indeed…. Again a constitutional crisis – and one that is not altogether impossible. So why is Theresa May seemingly so determined go through with Brexit? …why on earth is she – nominally at least – committed to “Brexit means Brexit” with the apparent passion of a zealot? Just what May is up to is difficult to discern. Like most people, I’ve never met her nor am I in contact with anyone who knows her. However, the media and the commentators do project certain memes about her which enable us to make some reasonable speculations. Clearly ORANGE ambition does influence her thoughts and behaviours. However, May seems to lack any great vision…for herself, the UK or the EU. The fact she was seeking ideas from her Cabinet at Chequers as to how to exit the EU – an Externally-Referencing meta-programme in action – rather than proclaiming her own vision would seem to indicate her ORANGE is weak. On the other hand the BLUE vMEME would seem to be incredibly strong in her vMEME stack. She does ‘the right thing’ and is obedient to the leader – a good lieutenant, as she was to Cameron. Which is probably why she lasted so long at the Home Office. May sought to carry out her duties as instructed, regardless of the costs to others. For example, her upsetting of the Police Federation at their annual conference became almost a tradition. The alienation of rank-and-file officers seemed to be of no concern. Nor even, when it came to it, the Association of Chief Police Officers! Caution, procedures, the facts, doing ‘what’s right’…these are the kinds of schemas that most likely dominate in May’s selfplex. Perhaps, now that she is the leader rather than the lieutenant, her BLUE takes its instruction from the electorate and doing ‘what’s right’ is what 51.89% of the electorate say they want? However, there is also a strong undercurrent of RED in May’s attitudes. Typical of RED’s avoidance of shame, her failure to reduce immigration in line with government targets was not her fault but the unavoidable consequence of the EU’s freedom of movement principle. Similarly her repeated failures to deport radical Islamist preachers such as Abu Qatada was due to restrictions imposed by the Human Rights Act (1988). Almost all politicians display very strong RED – to assert themselves as ‘the ones’ – and May wouldn’t be where she is without it. One intriguing question is whether Boris Johnson failed to register as would-be leader and Andrea Leadsom dropped out of the Conservative leadership race because they thought May was a more acceptable public ‘face’ but they could still manipulate her into giving them and their fellow Brexiteers powerful postions to advance their cause. Or did she give them the positions they got so they could be seen to fail as Brexit slowly but surely accelerates our kingdom’s problems and they are unable to deliver their department’s remits. Either way May seems far more concerned with her own position -her selfplex dominated by RED – than with duty to the welfare of our kingdom (BLUE). Doing what ‘the people’ want – or at least what a marginal 51.89% of them want – and keeping the Brexiteers off her back seem to be her main priorities. Thus, it seems her thinking is run primarily via a RED/blue vMEME harmonic. Doing ‘what’s right’ is very important indeed; but surviving and defending what she’s got – the premiership – is far more important. In other words, neutralising Johnson, Leadsom and their cronies is more important than the state of the pound or the ups and downs of the stock market. Another meta-state, from an Integated SocioPsychology perspective, is that May’s RED know its place in the power pecking order. She knows that, to maintain her position as prime minister, she has to do what those who are more powerful than her – Johnson, Leadsom, etc, etc – tell her to do. Who knows, at this moment in time, which – if either – of those scenarios is the more likely? Of course, it may be I’m wrong and there is some secret, wonderful arcane plan she has dreamed up that will take Britain into a incredibly prosperous post-EU future once the “initial difficulties” are over. But I can’t make out what it could be and neither can any commentator I’ve read or listened to. All it seems we get are the same “Brexit means Brexit” murky platitudes May and her seemingly-clueless Brexiteers have been tossing off – pun intended! – all Summer. No wonder the French talk about “le grand flou de Theresa May”. Whither the EU..? Why Brexit makes Me SO ANGRY!! This is somewhat ironic when the Brexiteers campaigned for UK Parliamentary sovereignty over Brussels – and now don’t want it! Just imagine if Scotland decide to leave the UK in the middle of the UK negotiating to leave the EU.